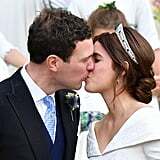 After revealing her Peter Pilotto wedding gown, Princess Eugenie got married to Jack Brooksbank, and of course there was a party to celebrate. 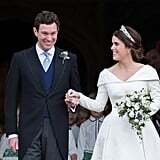 For the reception, Eugenie chose a blush Zac Posen number, and while her second party outfit included a white minidress, it, too, was capped off with a touch of pink. Designer Sam Dougal of Gainsbourg Atelier shared a snap of the custom biker jacket he created for Eugenie, which she had a hand in crafting alongside her stylist, Sarah Price. "The look is an exciting and unusual one for a royal wedding, and had to go with the feel of the day. The three of us worked on possible ideas and directions and decided to go with a young and super fun aesthetic. Much like Eugenie, the look is totally unique, and full of fun. 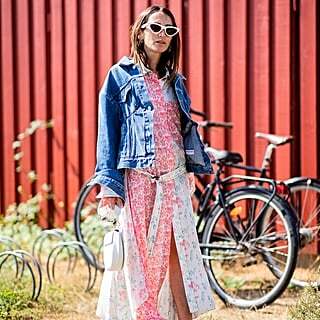 It's a simple party dress with a modern jacket . 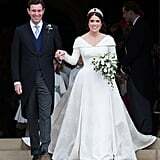 . . You only get married once and Eugenie wanted to stay with white for the weekends celebrations. 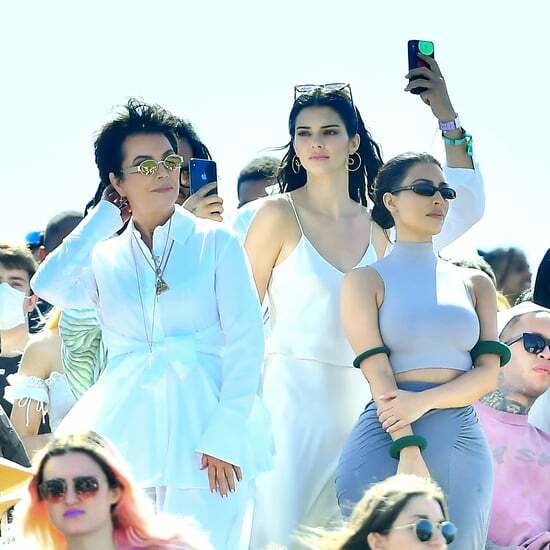 The addition of a pale pink jacket moves it forwards into day one of her marriage, especially with what is written in embroidery on the back," Sam revealed to Harper's Bazaar UK. 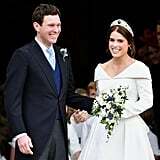 While Princess Eugenie is definitely the first royal to wear a moto coat on her special day, she also made the bold decision to go backless for her ceremony, showing off her scoliosis surgery scars with pride and confidence. We aren't surprised that this particular ensemble took a modern turn too, especially since Eugenie obviously trusts Sam's work. This isn't the first time he dreamed up a dress for her! Eugenie channeled Jackie O in a piece from Gainsbourg at Meghan and Harry's wedding in May 2018. Ahead, get another glimpse of Eugenie's rock star monogrammed outerwear, then see more photos of her and Jack exiting the church, and reminisce about the bespoke blue Gainsbourg dress from Sam's archives.